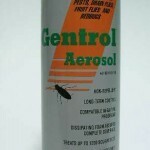 PRODUCT DESCRIPTION: Low odor aerosol that is applied to surfaces over which Bedbugs have been seen. It works as a growth regulator preventing bedbugs from being able to fully mature thus breaking their cycle. TARGET PESTS: Bedbugs, drain flies, fruit flies, meal moths, tobacco moths, red flour beetles, roaches, cigarette beetles, dermestids (carpet beetles). WHERE TO USE IT: In the home over carpeting, floors and beds. RATE OF APPLICATION: 16 oz per 1200 sq/ft.